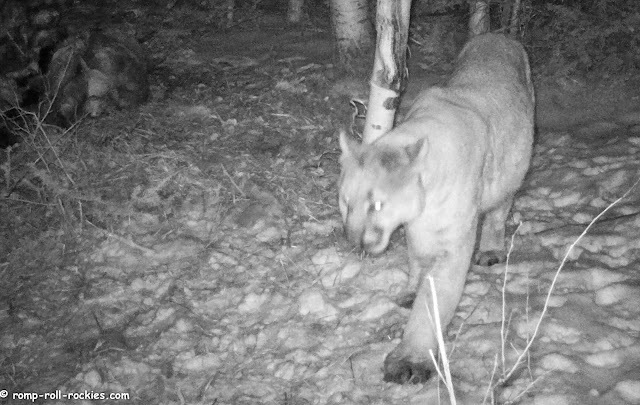 Last week, my friend called to say that he could see a mountain lion walking across a small meadow with coyotes circling around him. This was in broad daylight. He said that the lion seemed unconcerned with the coyotes. That scenario piqued both of our interest. I grabbed trail cams and headed over to look around with him after all seemed quiet. We guessed that there was a large carcass (killed by the lion) that they were vying to eat. We didn't find the carcass that day, which is a shame because it was probably fresh then. I should have brought Shyla on a long line so that she could have led us to it. The next day, the ravens and magpies showed us that a cow elk carcass was hidden under a tree covered in snow and debris. We'd walked right past it the day before because it was well hidden. 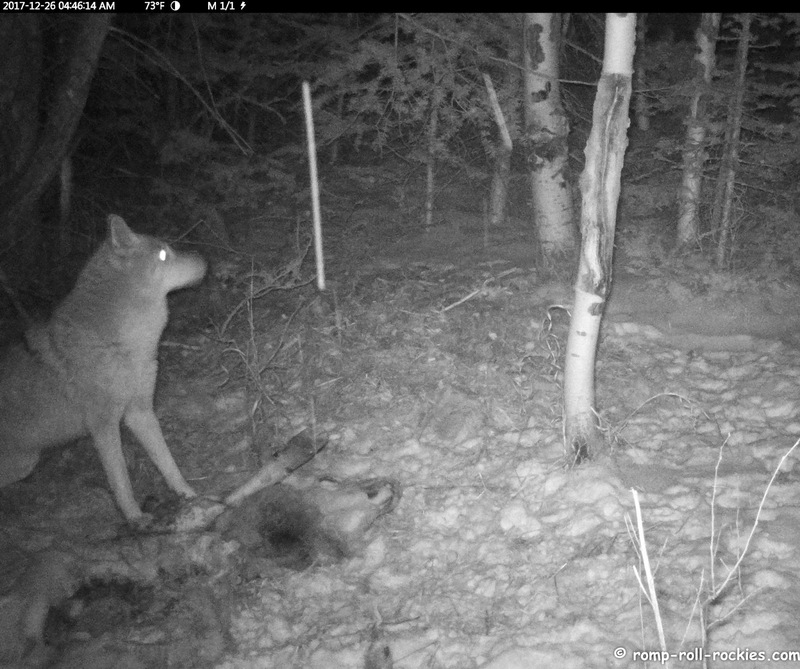 After finding the carcass, we put up two cams: one pointed at the carcass and one on the path that we thought that the lion and coyotes were using to access the carcass. We left the scene alone for two nights before checking it after a long night of coyote barking, yipping, and howling in the area. What we found on the memory cards was astounding. 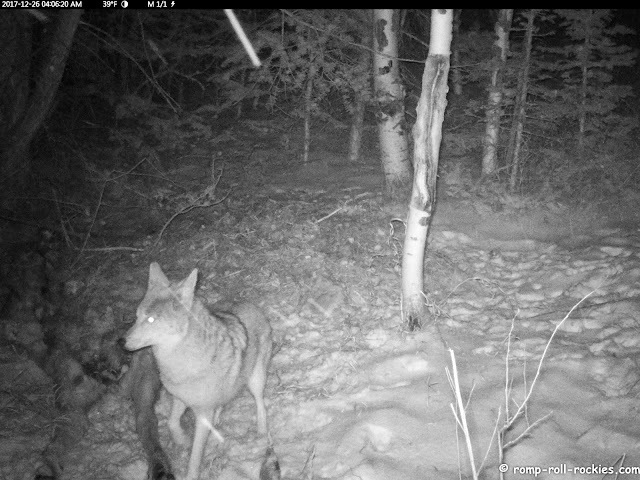 The first night was interesting, as the coyotes obviously wanted to pull the carcass out away from the dark forest where the lion could possibly ambush them. It was hard work for them because the carcass was so heavy but they managed to move it some. One coyote acted like the king but soon he was hiding from the lion. As soon as the lion arrived, he undid their work in a few seconds by pulling the carcass back under the forest trees. His impressively fast dragging of the carcass back under the trees is in the video. He didn't stay for long on that first night. Here he was, departing the scene. Night 2 was the most astounding. It included a coyote chasing the lion just after the lion had arrived on the scene. I'll put together a second video to show the remainder of Night 2. 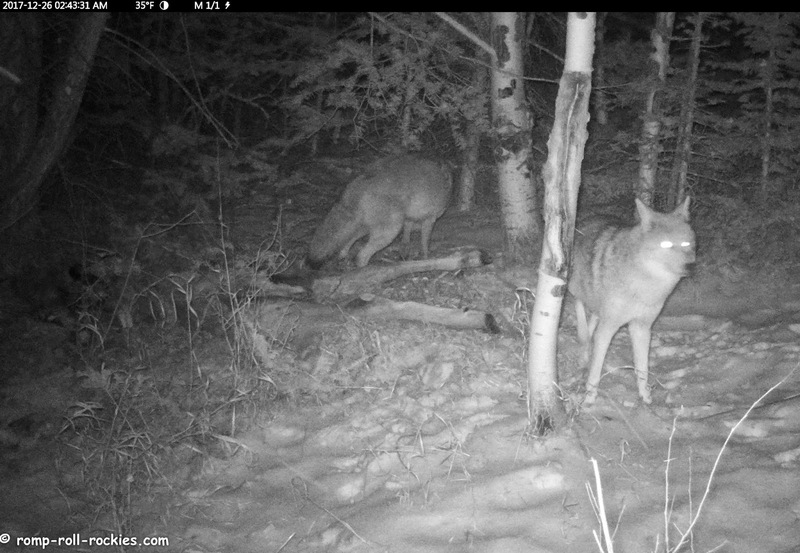 It will have lots of drama of the lion and coyotes simultaneously near the kill. WOW. That is so interesting. Nature just fascinates me. You were super lucky to have the chance at these images. How far is this from your home? It's within walking distance of my home - perhaps a bit less than a mile. However, I think that this sort of thing happens all around us. We usually don't know. The animals would prefer to stay hidden! It was very interesting to see how much stronger the lion was than the two coyotes. They could barely budge the elk, the lion moved it with ease. Amazing video!! Imagine how cool a live stream would be! That is amazing! We have coyotes passing in the neighborhood in the dark sometimes which we do not like at all. They can be real brave at times, I guess. Those thick coats and bushy tales, and hunger makes for competition at the table. Love that slow motion, gracefulness with each one . I am happy to see they are all fat and heathy . i would never have believed a lion would run from a coyote but i see he did. my first ever hearing of a barking coyote. Lots of drama at night! That's amazing! Your video is worth watching again and again! WHOA! What a pawesome video! That was one brave coyote! How wonderful that your friend saw them so you could get the cameras set up. We are amazed that the lion runs from the coyotes. Can't wait for video #2. KB, what an excellent video! I'm so surprised that the coyote chased the mountain lion away...that's pretty darn brave. Also amazing was the strength of the mountain lion-what a huge carcass. Hope you had a good Christmas and New Year's. All the best to you, the runner and the pack. Thanks to you and your friend for sharing such a hidden part of the world to most of us. I was surprised by the yip the coyote made before he chased the lion. Yes, I am unique in that regard! The man, Lee and I really loved this! Amazing! A little gang turf war going on there! Wow!! What a wonderful inside look on a nature turf war!! Thanks sooooo much for capturing this for us!! Holy smokes!!! You captured amazing, amazing nature! Fantastic, what a great neighbour you have to tell you about this so that you can set your trail cams up. It's totally amazing to see what does go on out there without anyones knowledge. I may not live in your country but I am fascinated by your wildlife, as I am mine. Thank you for sharing.